Often it’s the small, random details in a story that make it feel authentic. For instance, I love that in the LEGO movie, every character has fingermarks and realistic wear patterns, even though most of it is CGI. I used this story in a recent webinar and thought I’d re-tell it here. It still makes me smile. Back in the 1950’s, THIS guy (pictured right) â€“ Ellerton Jette â€“ was CEO of a small men’s shirt company called Hathaway. Hathaway began as a small business in the 1830s and was still a small business in 1950. Jette knew he had to do something big to change the company’s fortunes. Arguably the single biggest thing a CEO could do in the 1950’s was to get THIS guy (pictured left) on their side. 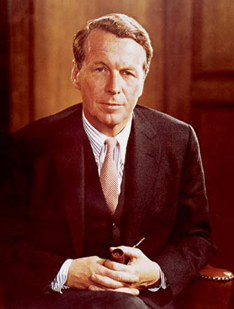 His name was David Ogilvy and he ran a marketing company called Ogilvy & Mather – one of the biggest in the world. Ogilvy is a legend to people in the advertising industry â€“ sometimes called ‘the father of advertising‘ â€“ but for the rest of us, think of him as the original Don Draper from Mad Men. Here was a guy who was good enough to single-handedly change the fortunes of your company. Jette’s main problem was Hathaway only had a modest $30k marketing budget to work with â€“ not the kind of budget that Ogilvy & Mather would usually bother with. 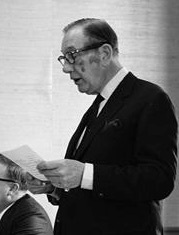 Ogilvy knew from experience that it’s often the smallest clients that will scrap hardest for every billed minute and copy change. So, when Jette finally managed to wrangle a meeting with Ogilvy, he was smart enough to immediately kill Ogilvy’s biggest concerns. The lesson? If you want someone to help YOU, find a way to help THEM first. Ogilvy surprised him by agreeing to take on the account. Ogilvy’s campaign idea doesn’t sound all that innovative, even for its time. A worldly, distinguished-looking gentleman model was selected and the photo shoot was booked to take place in a fancy men’s tailor. A touch of James Bond meets Ernest Hemingway. Nothing too remarkable there. But Ogilvy added one extra detail. On the way to the photo shoot, he stopped at a dime store to purchase a couple of 5-cent costume eye-patches. Fifteen minutes into the photo session he tossed an eye-patch to the model who then wore it for the rest of the shoot. When the campaign launched, the ‘Hathaway Man’ was given a rich and exotic back-story to go with his rich and exotic shirt materials â€“ all ‘mother-of-pearl buttons’, ‘Indian ivory’ , ‘Scotch voiles fabric’ and ‘Kildun cotton twill’. The ‘Man in the Hathaway Shirt‘ became hugely successful for the company and featured in dozens of advertisements till well into the 1980s. Hathaway grew to become the second largest shirtmaker in the U.S. So, Why Did Ogilvy Add the Eye-patch? How did he lose that eye? Was he in the war? Was it a bar fight? In fact, the first two Hathaway models DID have great real-world back-stories. The original model â€“ Baron George Wrangell â€“ was a genuine Russian aristocrat. The second Hathaway man – Colin Leslie Fox â€“ was originally a London bookmaker who left to lone sail the globe in his 23-foot yacht. Both interesting, sophisticated, ‘can-do’ guys. Unfortunately, despite the romance, both men owned two functioning eyes. Pity. But in the end, we make up our own stories. The success of the Hathaway campaign is a killer example of the value of embedding detail and story into your work â€“ and possibly even a little touch of the weird.